I've just bought a 1960 pickup!!! 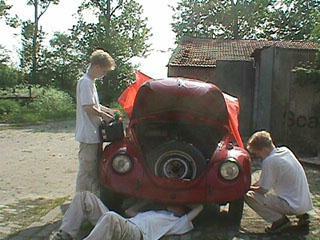 In the summer of 1999 bought a semi finished '74 Bug (1300). I was planning to use it as a daily-driver, but now it's up for sale as the pickup is a dream come true for me. Pim van Loon is my name and you might know me from my own Web Site (www.ploon.nl) or the stuff I've done for others like VW Euro (www.vweuro.nl) and (www.lvwcn.com). Right now I'm 24 years old (I'm from 4 Nov 1975) and I live in Kats a small village in the south west of Holland. Beetles have always been a passion of mine. I used to customize scale models and when I finally had my drivers license I already owned a '73 bay-window bus. At that time I did a mechanical engineering study (which I never finished. I'm a professional Web Designer right now) and some of my friends suggested it would be cool to go on vacation together. The need for a car was obvious and it had to be big, so they all looked in my direction as my reputation as VW fanatic meant I had to find us an old bus for the trip. We bought the first bus we came across (from the brother of another friend from school) and this turned out to be a bit of a lemon. 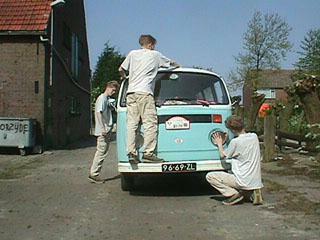 We spend 3 summer-breaks working on it and in 1999 we finally used it on a short trip to the UK (it had been to VW Euro '98 & London to Brighton '98, but not without problems). By that time I had saved enough money to get the ownership of the entire bus (my friends where partners in the project remember?). I bought a 74 beetle in the summer of '99 as a friend needed to the space in the garage. Again it was a bit of a basket case and this car is almost ready to pass it's road test after which I plan to sell it. In the autumn of 99 the engine of the bay-window bus exploded on the highway and we had to rebuild a spare case with new cylinders, pistons and heads to get the bus mobile again. Soon after that my good friend Hans Sprenkels pointed me in the direction of a very nice split-screen bus and I decided to sell the bay-window. The only problem was that the gearbox suddenly decided to make a lot of noise. 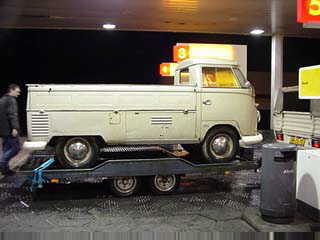 A buyer was found anyway, so now I can spend my time on my dream car: a 1960 pickup with only 27.500 km on it !!! Pim van Loon included a Link to the "Arte & Fusca - The VW Beetle and the Pop Art" Site in his Site, thus allowing the divulgation of the QUEST to more people around the world, helping a lot to proceed with the work! Pin and I were pen pals for some years and now we do correspond via Internet. He is a special kind of VW Enthusiast, the special kind of those that help to each other. He already helped to divulge the World Wide VW Beetle's Day by including a special page for this purpose on the Internet. Although he is a very busy person he always finds time to communicate. I'm very grateful for his attention to my ideas, to my work and to my person. Pin incluiu o Site Arte & Fusca em nos links de seu Site, com isto ele está ajudando a divulgá-lo. Pim e eu fomos correspondentes por algum tempo a agora nos comunicamos via Internet. Ele já vem colaborando com o meu trabalho há muito tempo, tanto que já tinha feito uma página para divulgar o Dia Mundial do Fusca. Mesmo sendo uma pessoa muito ocupada ele sempre encontra um tempo para comunicar-se comigo. Eu sou muito grato a Pim por sua atenção para minhas idéias, meu trabalho e minha pessoa. Luchtgekoelde Volkswagen Club Nederland (Vintage/Aircooled VW Club Holland). e-mail: "Pim van Loon - VW Euro"